Should you outsource your accounting, payroll and your IT services or should you keep everything in house? This question is critical to companies of today. The bigger question you should be asking yourself is that do you have all the expertise needed to run your operations if you were to keep your services in house? The answer can be extremely challenging if you are speaking about IT services. Technology is becoming increasingly more challenging with users needing the ability to have remote access, access from anywhere and from any device including BYOD – Bring your own device. Whenever there is a downtime of your IT service, the immediate response is to hire someone who can take care of all of their IT needs. The reality is, there is no such person who knows it all. Technology is becoming increasingly complicated, which means that not even every Managed Service Provder (MSP) can fully service every small business. To find the right MSP, you need to make sure to look for a MSP that services all aspects of what you are looking for to include telephony, networking, cloud services, information security, etc. Furthermore, you should look for a MSP that has dedicated account managers and technicians that service your area and can be on-site if critical IT outage takes place. Rather than hiring internal resources to manage your IT services, it is much more easier to outsource your IT services to an external Managed IT Services Provider that has the expertise in technology to manage your IT infrastructure, so you can focus on what matters to you most, running your business. Today, every company needs its IT services to be highly available, highly resilient and highly redundant. Down or non-functional IT services can potentially mean loss of revenue. 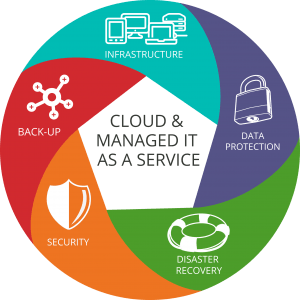 This is the reason why more and more companies are turning to an outsourced Managed IT Services provider with high availability and high resiliency. At AMS Networks, we guarantee an uptime of 99.999% of availability of all of our cloud services. A 99.999% of uptime means that we only have 5-6 minutes in an entire year for your IT services to be potentially down! This is the highest availability rate any Managed IT Services provider will be able to guarantee. Contact us today by calling 703-662-5800 to see how we take your organization to the next level and schedule a free on-site consultation.